Our nose is a delicate feature we depend on to breathe and smell. It contains the nasal cavity, which is molded by the olfactory, respiratory, and vestibule regions. When we have an irritation in our nose, the vestibule region, the nostril opening can become swollen, red, and sore. In a serious case, nasal vestibulitis presents with leaking mucus, causing the skin to become hard and crusty. We will discuss the causes of nasal vestibulitis and your options for nasal vestibulitis natural treatment. An inflammation of the skin within the nasal vestibule is referred to as nasal vestibulitis. It easily spreads to the insides of both nostrils. There are two types of this condition: acute and chronic. With acute vestibulitis, you can expect to have redness, swelling, and a thin or thick liquid secretion at the nostril opening. Chronic cases include these symptoms as well as the skin tissue becoming hard and forming a crust. As the skin quickly dries, it may begin to itch. Nasal vestibulitis is usually caused by a bacterial infection that affects the tissue of the nasal cavity. The inner lining of the nose may become inflamed for several reasons, and constant irritation of the membranes will cause them to thin and weaken. Let’s take a closer look at the causes behind nasal vestibulitis. Infection is the most common cause of nasal vestibulitis, whether from a bacterial or viral source. In addition to the symptoms, an infection can also cause the nasal tract to narrow, affecting your breathing ability through the nostrils. The bacteria Staphylococcus aureus is the leading infection cause. 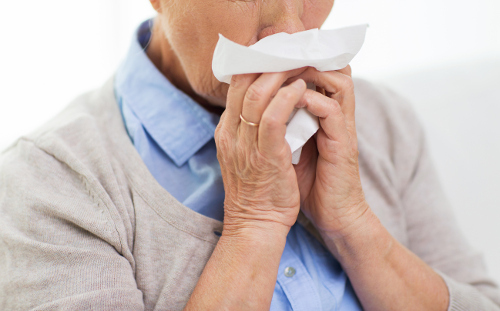 An irritated and inflamed nasal cavity can also result from your system reacting to an allergen such as dust and pollen or an environmental factor such as chemicals and toxins. Our body eliminates toxins from our system through mucus secretion from our nose. This may be caused by food ingredients rejected by our body or certain illnesses. Nasal vestibulitis can also be linked to regular nose picking, chronic rhinorrhea, folliculitis, and viral upper respiratory infections. The symptoms that can accompany nasal vestibulitis vary depending on the initial cause of the inflammation. You may experience one, or a combination, of the following symptoms in the vestibule. The symptoms may affect your ability to sleep and blow your nose. If caused by an infection that begins to spread, you may have facial swelling, pain, and redness on cheeks and around the eye regions. Your eyes may be affected if the infection enters the sinus cavity, causing vision problems. Are you experiencing any pain in the nose? Any discharge? If so, is it thick or thin? Have you noticed any blood coming from the nose? Has there been any change in your ability to breathe or smell? Nasal vestibulitis is treated at the source. To remove the dried, crusty mucus, a cotton swab soaked in hydrogen peroxide is used to gently clean the area. Oral and topical antibiotics can be prescribed by your doctor to fight the infection. With serious cases that have progressed, such as facial cellulitis, you may need to be treated with antibiotics through intravenous therapy. It is important to follow treatment instructions to prevent further nasal vestibulitis complications. There are a few natural treatments to try at home that may relieve symptoms. Add three drops of tea tree oil combined to a carrier oil, such as coconut or almond, and apply to the affected area with a cotton swab. Add two tablespoons of fresh mint leaves to two cups of boiled water. Cover and continue to boil for two to three minutes before straining leaves. You may add honey to the tea before drinking. Once a day, drink a glass of lukewarm water with the juice of one-half of a freshly squeezed lemon and a few drops of honey. Wait 30 minutes before eating. As nasal vestibulitis may be the result of certain allergens, infections, and toxins from within our own body, it is important to follow steps to prevent symptoms. Avoid foods that may create more mucus with digestion: dairy, citrus fruits, carbohydrates, and spicy foods. Follow a healthy diet to maintain regular bowel movements. Cleanse nostril with use of a neti pot. Yes and no. Depending on the cause, nasal vestibulitis may be contagious or may only be spread through indirect contact. There are a few ways to avoid spreading the infection. Wash hands regularly or use hand sanitizer. Thoroughly clean surfaces the infected person may have come in contact with such as doorknobs, counters, and shared items. Avoid public places when possible while infected. Nasal vestibulitis can be an annoying and painful affliction to deal with. It is best to treat the cause as soon as possible to prevent further complications. Some cases may need medical attention, and there are natural home remedies to treat some of the symptoms. Prevention is key and it is important to contain any infection by taking steps to avoid spreading nasal vestibulitis to others. “Nasal Vestibulitis: Causes, Signs, Symptoms, Risk Factors, Treatment,” ePain Assist; https://www.epainassist.com/face-mouth-throat/nasal-vestibulitis, last accessed April 3, 2017. “Nasal Vestibulitis,” Medigoo; https://www.medigoo.com/articles/nasal-vestibulitis/, last accessed April 3, 2017. “Nasal Vestibulitis,” Symptoms and Treatment; http://symptomstreatment.org/nasal-vestibulitis/, last accessed April 3, 2017. “Nasal Vestibulitis,” Curerator; http://curerator.com/remedy/nasal-vestibulitis/, last accessed April 3, 2017.